UK businesses are warming to robotics, but will post-Brexit Britain slam on the brakes? There are 33 robots for every 10,000 employees in the UK but the number could rise as automation increases. Businesses across the UK are becoming increasingly open to a robotic workforce. Those who were previously sceptical or distantly fascinated by our machine counterparts are now intrigued as to how they will enhance the future of the workplace. Benefits such as improved productivity and reduced long-term costs have gained the attention of board-level staff, intrigued by the prospect of future-proofing their organisation. However, despite a positive shift in behaviours, the UK is still lagging behind its counterparts in Germany, Japan, South Korea and the US, when it comes to robotic investment. In fact, recent research shows that although robotics contributed as much as 10 per cent of the total GDP growth over the last 22 years, the UK is still falling short. Will a robo-revolution help or hinder? For the last couple of years, robotics and AI have been firmly on the radar, driving many conversations and dividing industry leaders. With Brexit swiftly approaching, and companies across the country paying close attention to its impacts, will the UK’s departure from the European Union hinder a robo-revolution? Recent research from Deloitte revealed Brexit to be the top concern for CFOs, with the majority believing the business environment will worsen after the UK leaves the EU. However, if implemented in the right way, robotics has the potential to drive business growth, helping organisations achieve their goals. One of the key benefits of robotics is the ability to provide significant business value, on a consistent basis. Because the technology cannot become fatigued, it makes it a worthy candidate for laborious or repetitive tasks that staff tend to resent. Allocating rules-based jobs to robots means that the time you are paying human staff for can be better spent on adding real value to the business. It also greatly reduces, or eliminates, the number of employees carrying out mundane and manual tasks, resulting in increased productivity. Robotics also offers a certain level of future-proofing for aspirational companies looking to scale swiftly. Organisations need to ensure they are putting investment into the right areas, being confident that what they are putting money into today will turn a profit in the future. For those with high expansion plans, automated systems embrace control and standardisation. Not only does this mean that they apply the exact same process as programmed to, it means they can quickly adapt to any situation, as long as manually told to – all without additional training or costs. The benefits of the technologies seem clear, but with many business leaders adopting a mind-set of ‘skilled ignorance’, more needs to be done to promote the undeniable advantages of robotising core business processes. A recurring concern surrounding the potential robo-revolution is the loss of human jobs across various industries. ‘The rise of the robots’ is increasingly appearing as a trending term, raising alarm bells for the human population. However, like the majority of technology used in the workplace, robots shouldn’t pose a threat to people’s jobs, but assist them. Currently, the UK has just 33 robots per every 10,000 employees, with a recent economic study suggesting a positive relationship for employment. Robotic automation is increasing the total number of jobs available, but also changing them. The increased level of automation being enforced across the workplace highlights a need to rethink how we approach certain skillsets. The best RPA offerings out there are those that embody ‘process intimacy’, where entire processes such as ‘procure to pay’ are robotised. Rather than communicate with applications at the user interface level (UI) and mimicking user interactions, many software robots today have the added capability to communicate directly with core ERP and other business systems at the server level (API). This allows greater process standardisation, compliance, control and audit trail. Instead of simply swapping humans for robots across the business, there needs to be a strategic awareness present, one that allows companies to remain competitive and more importantly, profitable. A lot of people assume robotics are always used for mass production tasks, but they can also be used to benefit other areas of the organisation – essentially any role requiring large levels of computerisation. Contrary to the perceived wisdom, robotic processes tend to be far more secure than human-run processes. Why? Because software robots operate strictly within the defined regulatory and security perimeters. Needless to say, the same clearly programmed, unerring sequence of events is unlikely to occur under human watch – it’s all too easy to get distracted halfway through an email, leave a sensitive screen open during an emergency coffee run, or reply to rogue emails. This potential for error is even greater when a complicated end to end process extends across multiple geographies, requiring input from many different teams. The removal of humans from repetitive, rules based jobs can add true value to businesses. 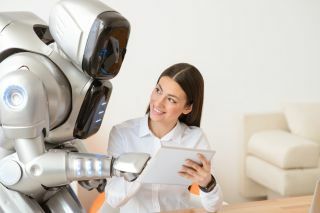 Rather than blindly mimicking the actions of a human, smart software robots can have built in ‘know-how’- an understanding of how to handle each processes step, having complete knowledge of finance, supply chain and HR processes from the outset. However, this removal of humans will not result in a complete loss of process control and job losses. In reality, the automation of processes end-to-end actually will actually enhance overall control, resulting in improved granular visibility. From 2017 to 2019, robot installations are estimated to increase by at least 13 per cent on average per year. For the UK to remain at the forefront of innovation and emerging developments there needs to be an increase in the level of understanding and adoption of robotics across the board. As it stands, businesses are aware of a limited number of the benefits that robotics can bring – whether it be to every day processes, growth plans, or initiative ideas. The investment into robotics can add great value, especially as they are more than likely to play some part in the future of the workforce, whether on a small or large scale. As with other technologies, they just need to be understood and applied in the correct way. Applied properly, process automation will not mean human replacement, more re-orienting the workforce around today’s technologies and digital processes. The robots have landed and the businesses that survive are those that will embrace the future rather than being constrained by what is no longer effective.